The woman who died in yesterday’s (Friday’s) six vehicle collision on the M1 has been named. Police have issued an appeal for anyone who may have witnessed the collision to come forward. Hundreds of drivers were left stranded, during a day of tragedy and chaos as police closed the motorway to clear and investigate the scene. Speaking before the victim had been officially named Assistant Chief Constable Alan Todd said: “I would firstly like to extend my condolences to the family of the woman who died following the six vehicle road traffic collision yesterday evening. “Police received a report of this road traffic collision shortly after 5.30pm yesterday, Friday, 8 April and immediately updated social media, media outlets and liaised with our partner agencies. Regular updates were issued to drivers and media throughout the evening. “We are aware of the difficulties and frustration caused last night and the major delays and inconvenience caused to commuters and families trying to get home. 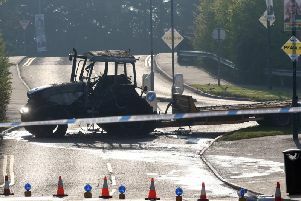 “It is with reluctance that we close any road, particularly a motorway during Friday evening rush hour however, following any fatal road traffic collision police have an obligation to carry out a full and thorough investigation into the exact circumstances of the collision and the scene must be closed in order for that investigation to take place. “Following this incident police had to safely remove the traffic from the motorway. Due to the amount of vehicular traffic at this time of evening, this took a considerable amount of time. “While we try to ensure that any disruption is kept to an absolute minimum, due to the location of this incident and the number of vehicles involved it was then necessary to close the motorway in both directions. “Both lanes were reopened during the early hours of this morning.